An apartment-style hotel in a relaxing spot, but also close to where the action is makes this hotel an ideal choice for those looking for a quiet holiday. 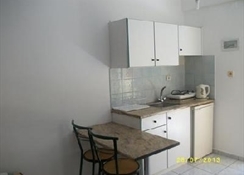 The hotel is on the main road of Stalis and offers a clean and pleasant accommodation to its guests. This hotel is suitable for young couples or a small group of friends and tourists who are looking to simply relax in a calm ambience with close vicinity to the resort centre. The hotel features an outdoor swimming pool with umbrellas and sun beds. The pool has a beautiful lawn and trees on both sides and the sun terrace is well-furnished with wooden furniture, canopies and parasols. 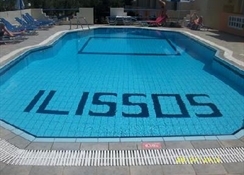 Ilissos Apartments comprises of 16 studios and apartments spread over two floors and each consists of a kitchenette, balcony and bathroom. The studio can sleep two to three people and the apartment can sleep up to four persons. All rooms are air-conditioned and provided with fridge, mini bar, safe and tea/coffee making facilities. Cots are available on request.Certain amenities may be payable locally. The poolside snack bar has a wide-ranging menu with interesting cocktails and tasty snacks to offer to its guests. Guests can also relish delicious food prepared in barbecue style, under the starry night sky with beautiful weather. 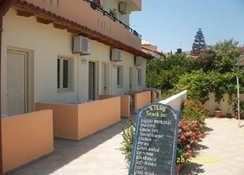 Ilissos Apartment is located only minutes away from the resort centre of Stalis and 300 metres away from the beach. Restaurants, taverns, bars and shops can be found at the resort centre and explored for a taste of the local culture and cuisine. Public transport is in close access of the hotel. The hotel overlooks the main coastal road and is surrounded by olive groves and garden area on two sides.